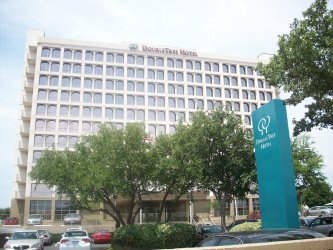 The Doubletree Hotel Dallas Market Center just west of Downtown Dallas in the heart of the Dallas Market District is conveniently located off I-35 (Stemmons Freeway) within walking distance of the Dallas Market Hall and the World Trade Center. Both Dallas-Fort Worth International Airport (DFW) and Dallas Love Field (DAL) are within 20 minutes of our freshly renovated, modern Dallas hotel. If you are traveling to the Dallas Market Center Area for a meeting at the Dallas Convention Center, a concert at American Airlines Center or visiting someone at Parkland Hospital, you'll be pleased that our Dallas, Texas hotel is less than five miles away. Infomart, BELO, the Department of Immigration & Naturalization and the University of Texas Southwestern Medical Center are also nearby. The tastefully appointed guest rooms and suites at our Dallas, TX hotel offer the perfect blend of traditional comfort and modern convenience with our luxurious Doubletree Sweet Dreams® beds, generous work spaces, and wired & wireless high-speed Internet access in guest rooms along with wireless in all public areas. After a day of meetings, sight-seeing or shopping, enjoy a workout in our Fitness Center or sunbathe by our sparkling outdoor pool. Relax with friends or colleagues in our elegant lounge, or dine in at Terranova Café serving all of your favorite dishes with a southwest flair - open for breakfast, lunch or dinner daily. Business travel is a snap at the Doubletree Hotel Dallas Market Center, with our convenient Business Center and over 7,000 square feet of flexible meeting space. Our beautiful meeting and ballroom space is fully supported by state-of-the-art audio visual capabilities and a professional meeting services staff. The Doubletree offers complete catering and banquet facilities for your important corporate event, training seminar, or social occasion. This Doubletree Hotel in Dallas, Texas is minutes from the many businesses and cultural attractions, as well as Children's, Parkland and Scottish Rite Medical Centers. We're moments from famous Dallas area attractions, nightlife, dining, and world class shopping like the West End and McKinney Avenue Entertainment districts, Deep Ellum, Superpages.com Center (formerly the Smirnoff Center), the Dallas World Aquarium, the Dallas Zoo, Lone Star Park, the Sixth Floor Museum, Dallas Galleria, NorthPark Shopping Center, Dallas Arts District, Fair Park, Cotton Bowl, Nokia Theatre, and the Majestic Theater. Whether traveling for business or pleasure, when you're looking for a Dallas hotel, know we'll pamper you with impeccable service and Texas hospitality. Our friendly, helpful hotel staff looks forward to welcoming you to Dallas, TX with our special, signature warm chocolate chip cookie at check-in.